Objectives: The objectives of the study are to evaluate the effectiveness of Homoeopathic Constitutional remedy (HC) and Homoeopathic Constitutional + Organ remedy (HCOM) in comparison to Placebo (PL) in cases of benign prostatic hyperplasia (BPH) using International Prostate Symptom Score (IPSS), ultrasonographic changes in prostate volume, post-void residual urine, uroflowmetry and in WHO Quality of Life (QOL)-BREF. Materials and Methods: A multicentric, three-armed, randomised clinical trial was conducted at five centres. Patients were enrolled following the pre-defined inclusion and exclusion criteria, randomised into three groups in 2:2:1 ratio and were followed up for 6 months. The statistical analysis was done with modified intention-to-treat principle (mITT). Results: Out of 461 patients screened, 254 patients were enrolled in the study and 241 patients were analysed as per mITT. The mean changes in IPSS and QOL due to urinary symptoms from baseline to end of study had shown a positive trend in all the three groups. However, in HC group, the changes were more prominent as compared to the other two groups. There was no difference between HC and HCOM groups and they were equally effective in terms of managing lower urinary tract symptoms due to BPH. With regard to secondary outcome, there was no difference between the groups. The psychological, social and environmental domains of WHOQOL-BREF have shown positive trend, but there was no statistically significant difference in intervention groups. Conclusion: In this study, statistical significance was found in the IPSS in all the three groups but only in HC and not in any of the objective parameters. Introduction: Blatta orientalis or oriental cockroach, also known as water bug or black beetle, belongs to class insecta and family Blattidae. In Homoeopathy, medicine prepared from it is used in a number of ailments, especially in the treatment of asthma. Materials and Methods: The physicochemical study includes evaluation of different parameters, namely foreign matter, moisture content, total ash, water-soluble and acid-insoluble ash values, water and ethanol extracts of the raw drug. Physicochemical studies, namely organoleptic specifications, sediment, specific gravity determination, total solids, pH measurement, thin-layer chromatography (TLC), ultraviolet-visible spectra and alcohol content have also standardised and presented for both in-house and commercial mother tinctures (finished products). Results: The study indicates that the values of the preliminary parameters of this drug are quite different from the ranges reported for plant drugs. TLC study confirms the complexity of the composition of the prepared drug. 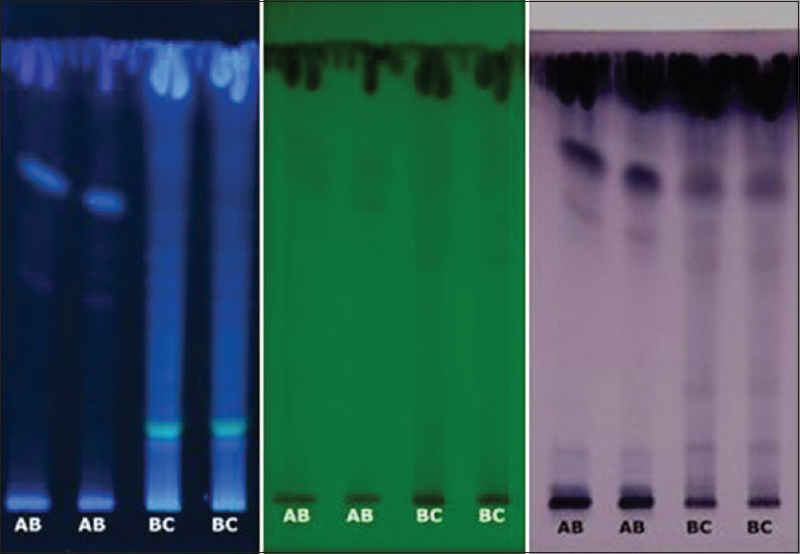 Conclusion: The physicochemical data of the drug, B. orientalis, may serve as pharmacopoeial standard for authentication, quality assurance and quality control process of the commercially available drug. Background: Gingival inflammation and plaque formation are a major health problem in worldwide. Objective: The objective of the study was to assess the variation of parameters of bleeding and plaque index (PI) in Gingivitis before, during and after intervention with Plantago. Materials and Methods: Thirty gingivitis patients were divided into two groups: control and test groups. Subjects were instructed to use toothpaste twice daily using the bass method up to 6 months. Clinical data were assessed at baseline, 3 months and 6 months which include an analysis of PI, Gingival Index (GI) and bleeding on probing (BOP). Results: Over a period of 6 months, there was a significant reduction in all the clinical parameters which includes GI, PI and BOP in test group with t-test (P = 0.001). i.e., Plantago showed significant effect compared to the control group. Repeated-measures ANOVA also showed a significant difference (P = 0.0001). Conclusion: There is a significant mean reduction in PI, GI and BOP in gingivitis before, during and after homoeopathic treatment with Plantago. Objective: To evaluate the effectiveness of homoeopathic remedies in improving quality of life (QoL) of chronic urticaria (CU) patients. Methods: Setting: The study population included patients attending the Outpatient Department of State Homoeopathic Dispensary, Ahmadpur, Aligarh, Uttar Pradesh, India. 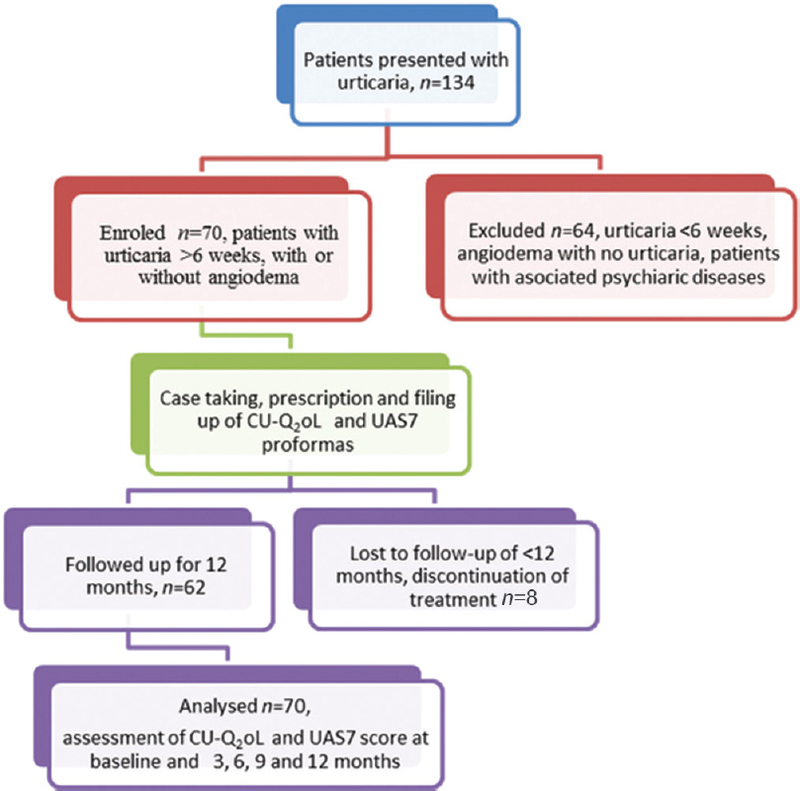 CU-QoL questionnaire (CU-Q2oL) and average Urticaria Activity Score for 7 days (UAS7) questionnaires were filled questionnaires were filled at baseline and 3rd, 6th, 9th and 12th months. The study included both male and female patients clinically diagnosed with CU, screened from January 2015 to June 2016. Eighteen homoeopathic remedies were used. The individualised prescription was based on the totality of each patient's symptoms. Scores were analysed using one-way repeated measures ANOVA with SPSS version 19. 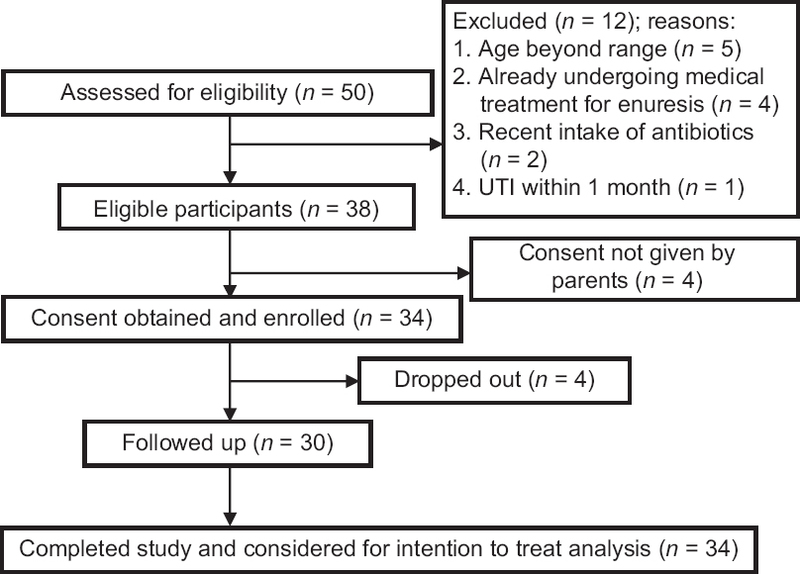 Results: A total of 134 patients were screened and 70 were diagnosed with CU and enrolled in the study were analysed under modified intention-to-treat approach. Significant difference was found in baseline and 12th month CU-Q2oL score (mean difference 34.14 with standard error of 1.65, 95% confidence interval, lower bound 29.31, upper limit 38.94, P < 0.001). A one-way repeated measures ANOVA was calculated for comparing CU-Q2oL scores (F [2.45, 169.46] = 260.89, P ≤ 0.000, effect size = 0.791). Apis mellifica (n = 10), Natrum muriaticum (n = 9), Rhus toxicodendron (n = 8) and Sulphur (n = 8) were the most frequently used remedies. Conclusions: Homoeopathic medicines have potential to improve QoL of CU patients by reducing pruritus, intensity of wheals, swelling, nervousness, and improve sleep, mood and concentration. Further studies with more sample size are desirable. Context: Nocturnal enuresis is a widespread and distressing condition that can have a deep impact on the subject's behavioural, emotional and social life. Aim: We intend to evaluate the role of homoeopathic treatment in nocturnal enuresis. 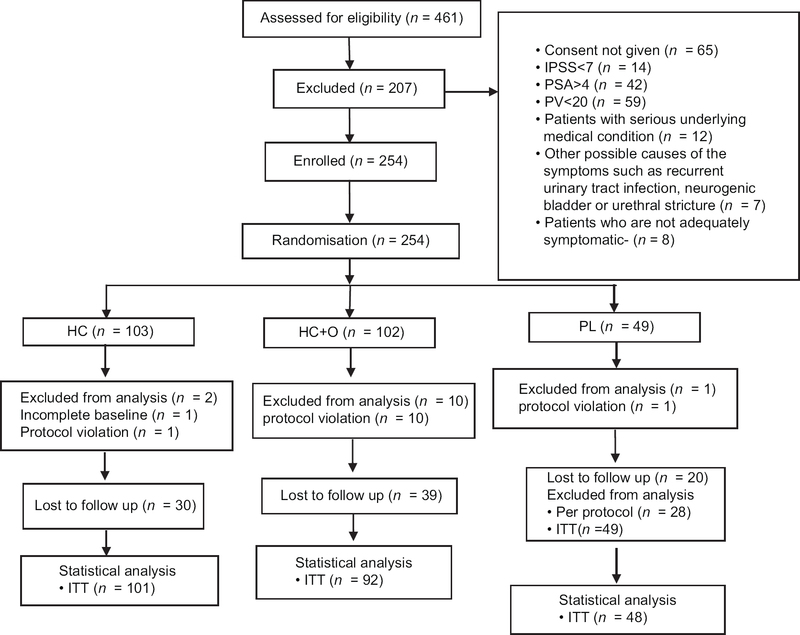 Materials and Methods: A prospective, single arm, pre-post comparison, non-randomised, open-label, observational trial on individuals of 5–18 years of age presenting with nocturnal enuresis at the outpatient department of The Calcutta Homoeopathic Medical College and Hospital was carried out. A total of 34 individuals were enrolled. A scoring scale was developed; scores were measured at baseline, after 2nd and 4th month. The intention to treat population was statistically analysed in the end. Results: The mean age of the patients was 8.71 ± 2.73 years; gender distribution was 1:1. Compared to baseline, scores reduced significantly over 2 months (11.6 ± 1.9 vs. 9.6 ± 3.5; mean difference: 2.0 ± 2.5 [95% confidence interval (CI): 1.2, 2.9]; t = 4.748; P < 0.0001 two-tailed; Student's t-test) and 4 months (11.6 ± 1.9 vs. 7.1 ± 4.8; mean difference: 4.5 ± 4.2 [95% CI: 3.1, 6.0]; t = 6.319; P < 0.0001). A post hoc one-way repeated measure ANOVA indicated significant time effect (F[2,32] = 311.286, P < 0.0001). Effect size was considerably large (Cohen's d: 0–2 months = 1.653; 0–4 months = 2.200). The most frequently indicated medicine was Kreosotum (n = 9; 26.5%). Conclusion: Homoeopathic medicines seemed to have a potential treatment effect in nocturnal enuresis. Controlled trials are warranted. Homoeopathy is among the commonly used alternative approaches in Cancer. It is being widely used as palliative and curative in patients suffering from cancer. Though studies on the use of Homoeopathy in cancer after surgery, radio therapy and chemotherapy have been reported, clinical trials on effects of Homoeopathy in cancer are rare. Some studies on the effect of dosage of Homoeopathic medicines and their mechanism of action in cancer have also been published. A few case reports published here and there also find a mention in different databases. 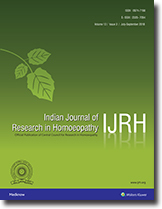 This review aims to describe literature available on the approach of Homoeopathy in Cancer by searching various databases like Elsevier, Google Scholar, Pub Med, Scopus, Springer and Wiley online library, electronically. It was found that beneficial effect of Homoeopathic medicines are reported on some cancer cell lines via apoptosis and immune modulation. Homoeopathic treatment given as add on also improves the quality of life, survival time and presenting complaints. However, more evidence needs to be generated to demonstrate anti tumor or antimetastatic potential in controlled clinical trials. Background: Before the 20th century, research in Homeopathy was limited either for its proving in healthy human volunteers or to its clinical verification/clinical efficacy in diseased individuals. 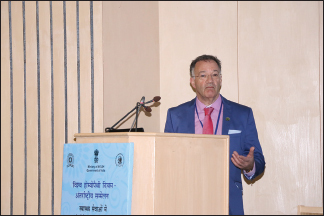 However, in recent years, there has been an increased trend in the number of pre-clinical studies aimed to evaluate the pharmacological activity produced by homeopathic medicines. The objective of this review is to make a systemic compilation of results of experimental pharmacological findings of homeopathic medicines, both in vitro and in animal models, and to present the same in a summarised form. Methods: Articles published up to March 2017 having information of in vitro and in vivo studies using homeopathic medicines were collected from the PubMed database, review articles, scientific reports, research articles, thesis, online information extracted from Medline, etc. to compile this review. The articles from the most common therapeutic areas such as antimicrobial effect, central nervous system disorders, anti-inflammatory and analgesic, anticancer, wound healing, antiasthmatic and liver toxicity and other therapeutic areas such as diabetes and malaria were included in this review. Results: This review article not only provides the scientific approaches applied in Homeopathy research but also provides evidence-based information on pharmacological effects of dilutions/potencies as well as mother tincture of different homeopathic drugs. This review article also reveals the use of improved methodology, molecular techniques and analytical part adopted in recently published research articles to understand the mechanism of action of homeopathic medicines. Conclusion: Homeopathy has substantial scope in pre-clinical research where therapeutic and biological effects of homeopathic medicines with proper mechanism of action can be traced out with the use of modern molecular techniques in in vivo and in vitro experiments. 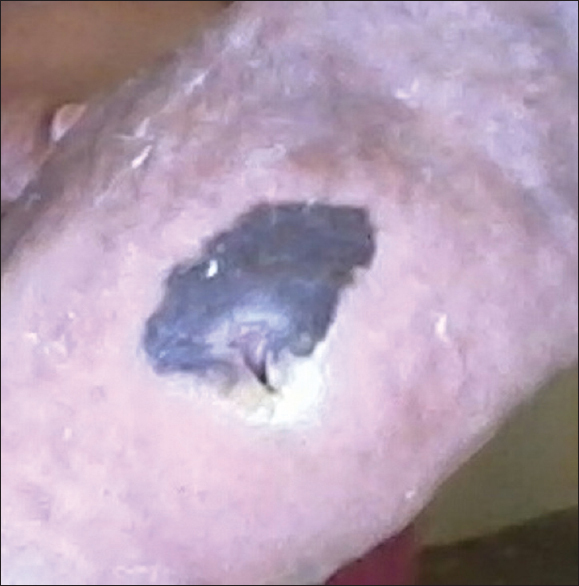 Diabetic foot ulcer (DFU) is a serious complication of diabetes associated with severe morbidity leading to poor quality of life and high cost of treatment. Many physicians are of the opinion that effective, multidisciplinary management of foot ulcer is necessary to avoid adverse consequences such as amputation and permanent disability. Homoeopathy offers an effective and safe management of these cases through its unique holistic approach. Here is one such case of chronic DFU, which has been refractory to the conventional management, treated satisfactorily with Homoeopathy. It has been observed that, with homoeopathic treatment, apart from healing of the ulcer, the general health of the patient has also improved. Dr. Peter Fisher, the radiant source of knowledge and influence is no more among us. It is not only the time to mourn and mull over all that he taught through his relentless efforts, but it is also for us to resolve to finish the unfulfilled tasks of the legendary Dr. Fisher and take Homoeopathy closer to getting that global nod. His priceless publications and editorials are a legacy he has left behind, which will certainly make for an ideal guiding light to achieve that nod.